With all that's going on at CNU, development-wise, I decided it was time to take on the challenge of a new topic I'll try to keep up to date. As y'all know, I didn't really come onto UP much last semester, so it was hard to keep you all updated, but I will try here! First, our new library (the Paul and Rosemary Trible Library... ...) has been completed! Sort of. The first phase of it has been opened and I must say that it is absolutely incredible. A huge rotunda with at least 35 foot ceilings, Einstein's (Starbucks) with massive seating, beautiful architectural details like massive and intricate crown moldings, study rooms with enormous chandeliers. The library is pretty fantastic, and worth a visit. Second, the old Student Center (which had been operating as our library while the present one was under construction) is being demolished across the quad/great lawn. In its place will rise a large, colonnaded brick building very similar in style to the David Student Union and the Trib Library, with offices and classrooms for government, the language departments, history, and others (the Liberal Arts building). It will feature a pass-through/breezeway similar to the one in the DSU to connect Potomac Hall(s) with main campus's Great Lawn. And, two future projects not yet currently under development/construction. First, there will eventually be a chapel on campus ("non-denominational"), hoping to emulate one such as Virginia Tech's. 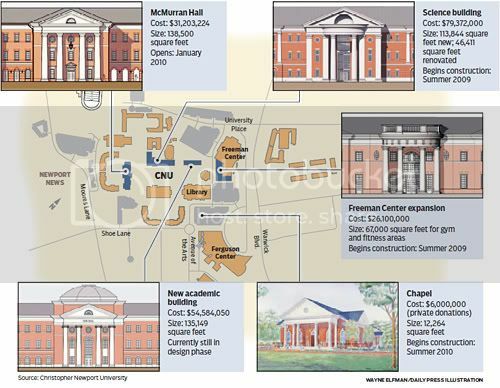 In all honesty, it will be a cash cow for CNU: get married in the chapel, have your reception in the DSU ballroom. A slam dunk for CNU's coffers. But anyway, the second future/major project will be the expansion of the Freeman Center (our fitness center, gymnasium/basketball courts, and other related offices - kind of like a convocation center). This expansion will add a swimming pool (yay!) and over 70,000 square feet of new space. Annnnnd, last but not least, is a plan to turn the parking lots by Santoro Residence Hall into a new residence village of sorts, with colonnaded entrances and apartments set up around an interior courtyard, similar to UVA's setup. As I find out more, I will certainly pass it along to you - and I'll try to post a few pictures of the new library later! Here's a link to the Library Grand Opening photo gallery. You can see P Trib and Rosemary schmoozing it up. There aren't many good pictures of the library itself, but there are a few showing the balconies of the rotunda as well as the scale of the rotunda (it's huuuuge). I'll probably search for more on facebook and pass 'em along. >>> Another link - an interesting picture of the grand staircase, shows a bit of the marble lobby floors. Wow, the library looks stunning. now they just need an architecture department. they have been making some good strides at that school to make it into a full fledge university. I go to CNU BTW. They just destroyed the old library/student center. "Hard hats will outnumber ball caps and backpacks on the Christopher Newport University campus this summer as construction crews tackle three building projects." Well, it's been a very long time since I've provided any updates on here... I managed to get out to CNU today and take a few pictures of all that's been going on. Sorry for the poor Blackberry camera quality, but they give a decent overview. Part of the new Integrated Science Center's front facade, below. Recently completed McMurran Hall (below), which houses History, Communications, Political Science, and many others, as well as CNU's three largest lecture halls. View of the Great Lawn's East-West (long) axis. Second floor balcony of the McMurran lobby. And, last but not least... the new master plan (through 2015). 14 new buildings are scheduled for completion over the next five years and I promise a better-quality picture in the future where I highlight some specifics. In brief, a new massive quad will be built adjacent to the current Great Lawn (northwest of the Freeman Center), 2 new residence halls (approx. 1,000-bed for 2nd through 4th year students), the chapel, an alumni center, and a few other expansions / renovations. It will look completely different in just a few short years. The transformation of this school has been amazing. It is such a huge asset for Newport News. I wish that Warrick Blvd would morph into a pedestrian friendly, college townish area through here. The new street improvements were a huge step in the right direction, now they just need to get rid of that old Boston Market and build new retail closer to the street, tear down everything they can and redevelop it like Hilton Village through here. The college kids have a nice campus, now they need all of the other stuff that makes the college experience so special. The need a coffee shop and a place for bands to play for starters. The Greenleaf could open a spot down there. That would be a nice fit. I had a long post about CNU's architecture, the good and the bad, but accidentally lost it. So I'll just pose a simple question, what do you CNU folks think about the neo-classical route? A friend and I visited the campus a few months ago, and we were both STUNNED (she's a CNU alum). I attended to a summer sports camp there in 1998 and '01, when the only dorm was Santoro, and then a few classrooms built in the 70s. The campus nowadays is a thing of beauty, and truly gives some of the other schools a run for the money. VERY impressive campus! Crap -- to the other two posts. The biggest complaint from CNU students is the lack of a true "university atmosphere" -- no bars, restaurants, things to do within easy walking distance. As Warwick continues to improve (it's SO nice now compared to even just a year ago) I think that will change though. Especially once the newest residence hall mirrors the old Village diagonally across Warwick. It would be EXCELLENT if a place like the Green Leafe went in there! As for academics and selectivity, by the numbers I can easily say that I would never have gotten in to the class of 2011, 12, or beyond. Kids now are averaging GPAs north of 3.8, with SATs well over 1200. That stands in stark contrast to even 5-6 years ago. The neo-classical look seems to be rather common, especially at regional schools. Regent University has a similar aesthetic, and any CNU student would feel at home at UNCW. When driving by Regent, I used to think, "Damn, why doesn't ODU have buildings like that?" I guess students are looking for that collegiate feel, and instructors might also crave that feeling of being at one of the "greatest liberal arts college campuses on the East Coast." CNU will never look outmoded, that's for sure. Classic is classic. But it's also limiting in someways. I guess what I'm trying to get at is that if you're designing a campus that isn't Harvard or William and Mary, why follow that model? It's not as if every physicist after Einstein should do their hair like Einstein to become one of the greats. Just as looking at a portico for any number of hours will not make you the next Thomas Jefferson. I recently went to the Grand Canyon, and on the road leading to the park is an IMAX theater that runs a film about the Grand Canyon... What's the point? Have you ever gotten to the end of trying to make a point and just not care anymore? I was just curious as to why they chose the look. I say CNU's buildings should all be shaped like schooners. Each with its own captain and cannons. I am decidedly pro-cannons!! That would be pretty interesting, and probably prove deadly.